I bought what is commonly called a K40 Chinese laser, it’s a 40 watt Co2 laser that only costs about $400. That may sound great at first, but these things take a lot of upgrades to make them usable and they come with a whole host of issues. The main issue is that the thing is rather large and bulky and the cutting size is rather small, it also needs to be water cooled so you need to keep a bucket of water nearby. The software has to be the biggest drawback, it only runs well on windows XP, it can run on windows 7 but it crashes all the time. I was able to get my hands on an old laptop and it runs the cutting software really well. I have made a few mods so far mostly replacing the cutting surface, before it had an odd clamp system, but I replaced it with a honeycomb aluminum laser bed that works much better. The bed size is 27.5 cm by 17.5 cm. I know the laser cutter can cut a little larger then that, but not by very much and I run into the issue of the laser head hitting the end of the track. There are no sensors telling the laser head that it has reached its end so it will just keep trying to move forward damaging the motors. The control panel on the cutter is very simple, there are two buttons, a gadget and a potentiometer knob. The switch marked “Current Indication” is a latch switch that arms and disarms the laser, the button “Current Regulation” fires the laser for testing. The Knob changes how much power is used when the laser cutter is in operation. The scale around the knob is something I created, before it had no markings denoting power settings. I just got a precision potentiometer that will allow me to dial in the power more precisely and I am planning to replace the laser cutting head with one that lets me use air assist to blow air at what I am cutting to help with debris and things catching fire. The new laser head requires a new focusing lens that I will need to order because the one it currently uses is too small for the new cutting head. I also will be adding a cross hair laser mount so I can pinpoint where the laser is firing so I can line up jobs better. Maybe someday I will upgrade the motors, add a better exhaust fan and many other upgrades that will make this device more usable. I have already made a few cool things using my laser cutter, I really like engraving and cutting acrylic. This was one of the first things I cut out, the edges are a little rough because the laser did not cut all the way through. This is a design I made for the Table top Gaming library, a group I am part of that brings their large library to conventions for people to play. Lastly, I made something I have always wanted, Kanto gym badges from the original Pokemon red and blue Games. The very first video game I ever owned was Pokemon red so these have a very special place in my nerdy heart. The color just comes from paper glued to the back of the acrylic, I will be making these into badges you can wear. I already have been in talks with some friends to do some things for them, I might be even producing some products for a convention vendor that I met. I hope these new projects can help pay for upgrades and materials for my own projects. This little tool is amazing and I cannot wait to see what else I can do with it. I have been spending time finding the right settings for each material I use so I can get consistent results. I will be posting more about the different projects as I get the time, I really want to get some videos up on the channel of the project builds. Thank you for reading, please check out other articles and posts to see other things I have made. A good friend of mine asked if I could make a small Stargate from the Show Stargate SG1 and I decided to take on the challenge! It needed to be light and break apart enough to fit into a car for transport. I first found a good image of a Stargate and brought it into a program called Illustrator. I turned it into a vector image and enlarged it until it was the right size. I only printed out the symbols and a template for the chevron locks that appear around the outside. The main structure of the Stargate is pink insulation foam, I made it two layers thick and I offset the layers so it fits together like a puzzle. I used a pen, a piece of string and a nail to make the inner and outer lines of the ring then cut it out. Once I had the main structure I used a metal tool with a rounded end to create details by dragging the tool across the foam. It was easy to make lines on the foam because it’s so soft, after all the lines were set I went back over them with a sharpie to make them stand out. In hindsight that was an unneeded step seeing as how I was going to paint the whole thing. Once the lines were defined the gate looked like this. Next I cut out the chevron locks out of foam and placed them around the edges of the gate. On these pieces i used an sharp blade to cut out the designs on the face of the chevron locks to match the design in the show. Once I had all nine made glued them to the main gate piece. I tried to make them as equally distant as I could, but I made a little allowance for having a base at the bottom. Next I went over the foam with a white water based primer and made sure to keep the spray can away from the foam or the propellant would melt the foam. Once I got three coats down, then I painted the whole thing with a black hammered texture spray paint. I painted the center of the chevron locks red and outlined all the details using silver sharpie. I used Velcro to hold the parts together where they join, I had to add extra glue to the Velcro strips so they held. The base is made out of 2×4 and painted black, I wanted to make it heavy so it would support the Stargate. I designed the stand so that the Stargate would fit snugly in the base. It all held up rather well, the foam did make it bend easy, but once set up it was rather stable. I later added bolts to hold the pieces together, it was much more stable after that. The last part was to add some lights, I got some blue and red EL wire and outlined some of the symbols and chevron locks. It looks great when the lights are dark, I did not know how to do electronics back then or I could make a dialing effect. And that is my Stargate build, if you have any questions about this build or anything else, feel free to comment below or drop me a line using the contact page. This was the first prop I ever made for someone I have never met. I also have never seen the show My Little Pony but I have a friend who knows it well and I used his advice a lot. The client gave me a reference image to use for the staff, its only black and green but i was able to get relative dimensions. I used a program called Illustrator to layout the design and then broke it into pieces that could be printed on letter sized paper. Once I cut out all the paper pieces i was able to assemble my template, i had to make the staff thicker than the image or it would break to easy. I wanted to make this prop light weight and easy to carry around all day. I made the form out of pink insulation foam and carved it down to the rough shape I needed. Pink foam is very light and really easy to shape. Looking back, I wish I would have taken the time to make a mold and cast this whole staff in resin. Once I had the rough shape I took a sharp blade and cut away the corners and shaped the staff. You can sand insulation foam easily and get a relatively smooth surface. I took a metal rod and drove it through the center so it was stable and did not bend. I gave the staff several coats of PVA glue also known as Mod Podge to seal the surface of the foam. Next I coated the sealed foam with some resin, I made the mistake of using clear resin. Clear resin takes much longer to cure than normal resin so it took many applications to get the right effect. 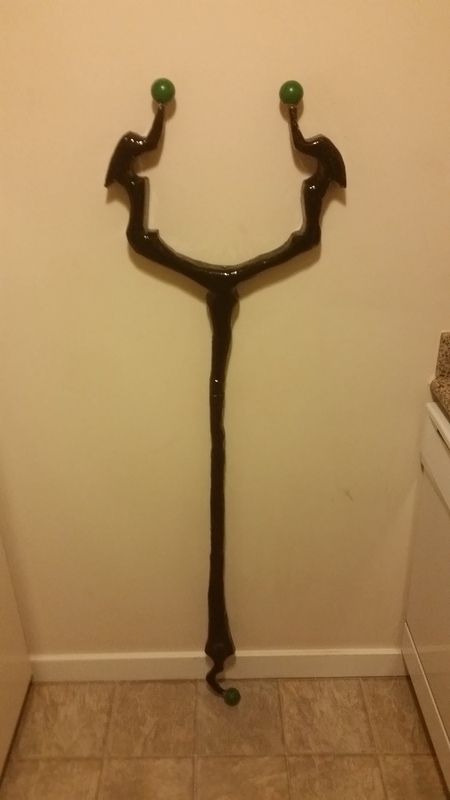 I hit the whole staff with a coat of black gloss paint and then sealed it with a clear coat. I took some rubber balls, painted them, sealed them and then mounted them to the top horn tips and the bottom using metal rods. The last step was making the heart, I shaped it out of pink insulation foam in two half’s. I glued these two half’s together, I coated this with PVA glue and then painted and sealed it. I took some fishing wire and suspended the heart in the center of the fork of the staff. 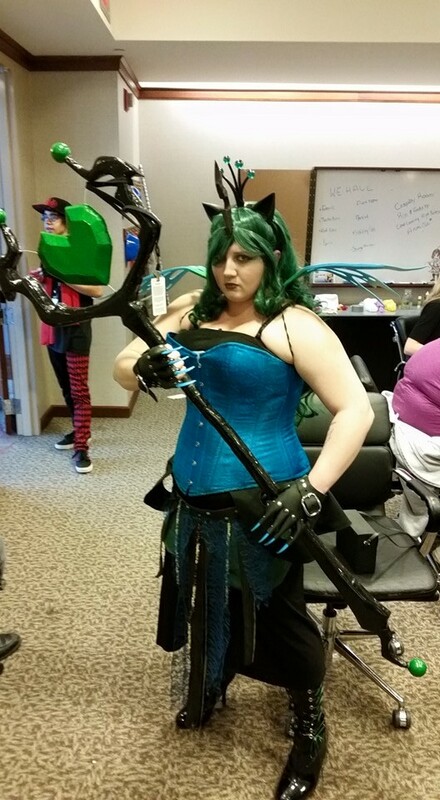 This is a photo of the client holding the staff at the 2014 Shutocon. She loved the prop and many people seemed to like it as well. I want to prefix this by saying I went into this build having never watched the anime “Fairy Tale”. The build was very long and drawn out because the build started just before me and my wife found out we needed to move. This was a very unique build, it was my second commission for someone I did not know. It’s odd how the first two commissions I have done were from anime or shows I have never seen. I went into this build with many ideas on how to make this prop with the skills I had and the material knowledge I had. In the end, I used tools and materials I had never tried to get a prop I was proud of. I thought about making a mold and doing a slush casting, the issue with this is that most clear resin has such a slow cure time that you can’t slush cast it. I also did not know how to make molds or how to cast resin. I settled on using PETG thermal plastic and hand molding it around a buck using a heat gun. I tried using Plexiglas first, but it did not bend well enough and it became brittle too easy. I started by making a buck that was the rough size of the finished blade. This buck was made out of expanding foam around a wooden dole. This took a long time and was very messy, I don’t think I would ever use expanding foam in this way again. Turning a flat piece of thermal plastic into a rounded 3D form takes a lot of work and learning. It took many hours to get the main body of the blade done and smoothed out to the right shape. One of the benefits of using PETG is that when you eat two pieces and press them together they bond so I did not need to use glue on any of this prop. This is what the main body looked like when the main body had a basic shape, I did more shaping after this, but it took so long to even go this point. I was getting used to the process of shaping and bonding the PETG thermal plastic. Next I needed to add some spikes, this was a lot like forming the main body, I formed a cone, and then cut a slant on the cone and heat bonded the cone to the main body. This required a lot of molding and time, every spike went on differently. I needed to make a handle on the inside so you can hold the blade while wearing it. I took a piece of PETG and folded it so it had smooth edges. Then I bent each side of the handle and bonded it to the inside walls. Next I took my air brush and put on a light coat of blue and white, I wanted to make it look like ice. It also slightly obscures the arm inside and hides the fact that you are holding onto a handle. After I finished painting it, I hit it with a clear coat to lock in the paint. 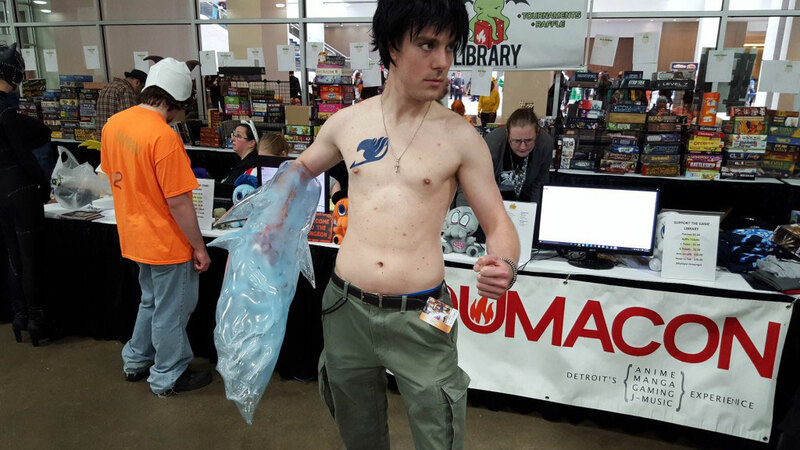 Below are photos of the client wearing the prop as part of his Gray Fullbuster Cosplay. He was very happy with the prop and it got a lot of compliments at Youmacon 2015. If you have any questions about this build or anything please feel free to comment or go to the contact page and drop me a line. If there is one thing I feel like I need to get better at, it is documenting my builds. I get so caught up in what I am doing that I don’t take enough photos of what I am making. I only have a few photos from this project, and two of them are the same only I added a single detail. It’s a process I am working on and I get a little better each time. I will be using photos from the resources I used when making this helmet, I will cite these sources where ever I have used them. This helmet is the start of Mandalorian Mercenary Cosplay build that I will do a whole different post about. Not everyone knows a lot about the Mandalorian’s because their story exists outside the Star Wars universe shown in the movies. They are the best Mercenaries in existence, at once point they controlled half the known galaxy. The only two Mandalorian’s ever shown in the Star Wars movies to my knowledge has been Jango Fett and his clone/son Boba Fett. A lot of what the Mandalorian armor style can be seen on the armor they wear. Helmet shape, The T shaped visor, and armor plating style. I know this post so far has been a long walk for a short drink of water, but I am getting to it but a little background won’t kill you. The reason I wanted to make a set of Mandalorian armor is because with the Mandalorian’s each set of armor has similar elements, but there is freedom to make the armor your own. I am a large guy and I need cosplays that fit my size and the freedom of the design lets me do this. Ok on to the helmet build! It looked simple enough but only after making the helmet did I realize how much skill they must have had to make the images I saw in the examples. I had the templates printed on card stock at a local Kinkos because that way it was much easier to trace them onto the material I was using. The material I uses is a product called newspaper board made by a company called Crescent. I bought mine at Hobby Lobby and one sheet was enough for my whole build. The other materials needed are hot glue, a sharp blade, lightweight spackling paste and something to seal it with, I used resin. You will also need a cheap spray bottle so you can wet the newspaper board and make it bend better. I am not going to go over the whole build because the Instructables article does a nice job. The only think I want to add is that do not glue the cardboard when it is wet because it will just fall apart on you. I did add extra details to my helmet that were not in the tutorial and I skipped the ear and range finder pieces because I think it looks better without them. After I finished with the steps in the tutorial my helmet looked like this. I made mine look a little different than the template, the bottom part of the T shape is not the same all the way down like in the tutorial version. This was a happy mistake because I did not intend to do it, but I like the outcome. At this point I was off the map, I had to go on alone using my own skills. The next part took me a while and I made a lot of mistakes that I hid in later steps, but I decided to use resin to seal the helmet. I bought some casting resin from a local stone. My first mistake was mixing up too much resin for the first coat. A really odd fact I learned is that the set time for resin depends on the thickness of the resin and it works the exact opposite from something that needs to dry like glue or paint. The more resin you have in a cup or mold the faster it will set and thinner it is the longer it will take to set. The cool thing is that it sets from the inside out, if you watch resin set it happens very fast and it always starts from where the resin is thickest and moves outward. I only used about 25% of the resin in the cup before it sets on me, from that part onward I had to do this in small batches or I would waist more resin. Every time the resin dried, I would sand it down the best I can and clean up and drips or areas where it was uneven. It took most of a Saturday to do it, but I finally got the whole thing resin coated. I sanded it some more and painted it with a black paint/primer. Then I used one of the best products I have ever used called Rub N Buff. It is a paint that can give anything a metallic look to it, the kind I used was called “Rub N Buff: Silver Leave”. I took an old sock and applied a small amount to it, I rubbed this on a piece of foam board to get a light coating on the sock/rag. I then lightly brushed on the silver and almost immediately it looked amazing! After I was happy how the Rub n Buff looked I sealed it with some clear spray shellac to lock in the color and make sure one of it rubs off. This is what it looked like after I did the base metallic treatment, I was really happy with it, but I wanted to add a little something more. I have an airbrush and I mixed up some metallic paint and added the only detail I had in mind a scarf in red over one eye. It was only after I did it that I realized that it looked like Kratos from The God of War games. Once that dried, I hit it with one more coat of the clear spray shellac. Then I removed the tape covering the visor, the helmet still fit nicely and I could see just fine out of it. The last step I took was to add some tinting to the visor so I could see out, but no one can see my eyes. It did not come out very well because the glass was not smooth. I might re-do this part later and add some more weathering to the armor to make it look more weathered. This is what the helmet looks like right now, I am very happy with it and I have already started working on my armor design. The armor will be made out of Sintra PCV board, I have never worked with it before, but I hear it’s great for making armor. I hope you have enjoyed this rambling overview of my blood Scar helmet, if you have any questions, please comment below and I will answer them. I added some ventilation fans and covers to the helmet, i wanted to make the covers look like parts of a gas mask i think it looks great.